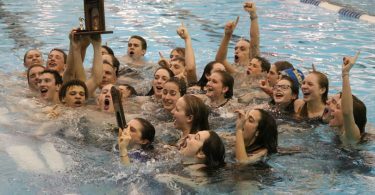 The Jefferson Swim League’s Championship Meet returned to its traditional venue this year at UVa’s Aquatics and Fitness Center after a year at Fork Union Military Academy and the league didn’t miss a beat in its homecoming with thousands of swimmers and parents descending on the pool. As usual a host of stars that have graced the lanes throughout their childhood like Crozet’s Noah Holstege swam their final races for the league, The Elks’ Abby Fuller continued to cement herself as one of the area’s finest talents and a number of young swimmers announced their presence on the local swim scene with record-breaking efforts in the younger age groups. Fairview notched another league championship, the club’s fifth straight, with a score for 2,340.5 points while Crozet took second with 2,191.5 and Boar’s Head finished third with 2,160.75 points in a tight race at the top of the standings. Hollymead won the Division II championship while Glenmore took home the D3 title. Crozet’s Holstege, a Covenant grad headed to Calvin College, notched a high point award in the 15-18 year old group while winning the 50-freestyle, 50-backstroke and 50-breastroke. Holstege was the VISAA state champ in the 50 free back in February. August Lamb, who had a monster season as a junior at Western, had the second highest point total in the 15-18 year old group for third place Boar’s Head, winning the 100 IM, taking second in the 50-free and winning the 100-free. Fuller, who wrapped up a solid freshman year at Fluvanna earlier this year, was dominant, swimming to meet records in the 13-14 year old group in three different races. She set a record in the 50-free, breaking a mark that dated back to 1993 when Key West swimmer Rebecca Cronk notched it. She set a new standard in the 50 breastroke as well, going 30.33 to beat a mark set in 2016 by Fluvanna teammate Abby Harlow and she broke Ashley Huang’s 2014 mark in the 50-fly with a time of 25.82. She was also the high point winner in the 13-14 year old group. Fairview’s Victor Valovalo was the boys side’s 13-14 year old high point swimmer and set a new record in the 50-fly, breaking Alex Montes de Oca’s 2009 mark. Several other new individual marks were set too, with Fairview’s Jack Dofflemyer setting a new 11-12 yard old 50-fly mark, Farmington’s Peyton Wray setting a mark in the 13-14 year old boys 50 backstroke, Crozet’s Meghan Ayres setting a record in the eight and under 25 breaststroke and Forest Lakes’ Rylee Shumate notching a new mark in the eight and under 25 freestyle. Other records broken on the day included the boys 9-10 200-medley relay with ACAC setting a new mark, Fairview’s girls 11-12 year old 200-medley team broke a 2011 record, ACAC’s boys 13-14 200-medley team set a new standard and the ACAC boys six and under group set a 100 freestyle record. In the 15-18 year old girls side Abigayle Harlow of Lake Monticello — winner of the 50-breast and 50-fly — and Fairview’s Claire Moody– champion in the 50-free and 100-free — tied for the high point award while Gabriella Tosi of Fairview was the runner-up. Maren Weathersby won the girls 15-18 50-backstroke. Glenmore’s Charles Davidson and Crozet’s Ayres took the high point awards in the eight and under group. In the boys’ 9-10, Fluvanna’s Aiden Ding, ACAC’s Chase Easton and ACAC’s Bradley Sawyer tied for the high point award while Fairview’s Diana Ismailova won the award on the girls side. In the 11-12 age group, Farmington’s Max Moore was the boys high point winner while Farmington’s Grey Davis won on the girls side. Fairview’s Victor Valovalo won the boys 13-14 high point title while the Elks’ Abby Fuller posted the highest girls score.